You don’t have to be a wildland firefighter to know it’s not the most glamorous of jobs. Hard physical labor under incredible pressure in suffocating heat far, far away from home? Yeah, no thanks. We’re doing just fine sleeping at our desk. So when we lose a peer who put his or her life on the line for our sake, we feel a strange mixture of pride and guilt. Pride in the unbelievable heroics and sacrifice of humanity; guilt that someone gave their life, literally, to protect our comfortable lifestyle. That’s exactly where we found ourselves upon hearing of the death of Justin Beebe. 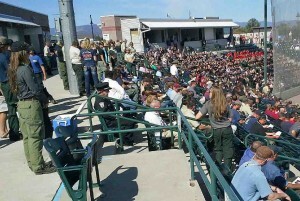 Beebe, 26, was killed by a falling tree while fighting fire with the Lolo Hotshots in eastern Nevada last August. 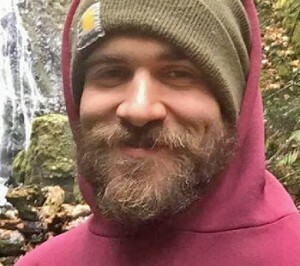 According to the story, he left his home in Vermont with a stash of his family’s maple syrup and as he interviewed with fire crews he left a can behind – a memento of gratitude. His endearing ways caught the attention of Shawn Faiella, assistant superintendent for the Lolo Hotshots. Seven months later, Beebe was killed. So what do we do with this strange blend of pride and guilt? h coworkers and loved ones, and then forget about it. But that doesn’t allow for a meaningful manifestation of either emotion. So how about this: How about today, instead of dwelling in the easy-to-dismiss toxic guilt, we feel instead a healthy sense of guilt – the appropriate kind that leads to empathy and compassion? And how about we transform our internal pride into an external sense of gratitude? How about we show Beebe’s family, his peers on the Lolo crew and their families – in fact, all the great firefighters, military service members and first responders – that we really do appreciate what they do? Some of you already undertake this important responsibility, and for you we are also thankful. But some of us know we could do better – and there’s never a better time to step up and start doing so than now. 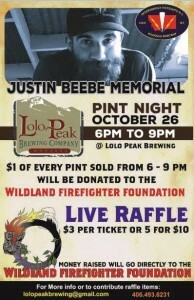 Tomorrow night, join us at Lolo Peak Brewing Company for a special Beebe memorial and fundraiser for the Wildland Firefighter Foundation. the line of action, including both immediate assistance with medical, transportation and funeral costs as well as long-term grief recovery and support. The brewery has committed to donating a dollar of every pint sold 6-9 pm to the foundation, and members of the Lolo Hotshots will raise even more money through a live raffle. Brewery managers have promised a large fire, and of course you’re always encouraged to partake in the brewery’s amazing pub fare. So come eat, have a little fun, give a little time, give a little money. They’ll feel a little better and you’ll feel a little better – we guarantee it. For more information about Wednesday’s memorial and fundraiser, call 493-6231.